Once again commits are piling up all over as the Class of 2014 decides where to spend the next two to four years of their careers. Over in Middle Tennessee the program making the most noise appears to be the Bucks of Motlow State. Second year head man Matt Sligh turned some heads last season bringing the Bucks from an early season project to one of the toughest outs in the league come tournament time. The success paid off handsomely as the Bucks received the biggest of the recruiting coups in the latest round of commitments with 2014 Class AA state tournament star Terry Holt (East Nashville) pledging to attend Motlow. 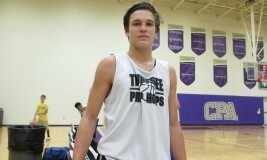 Holt was on the radar for several D1 schools and was the second highest player in the Class of 2014 still available. The Bucks didn't rest on their recruiting laurels bringing more talent into the family with the additions of Jacob Saunders (Cheatham County) and Jordan Darden (Cheatham County). The Duo led the Cubs to one of the best finishes in their schools history, playing unblemished basketball until deep into the regional finals. Staying in the Junior College ranks in Tennessee, Volunteer State and venerable mentor Rusty Melvin inked a pair of in-state kids with the signing of Juanya Smith (Hillsboro) and Christian Lynn (Goodpasture). Coach Randy Nesbit at Roane State in Harriman brings another newcomer to the fold in shooting sensation Joey Skibbie (Hume Fogg). Regular season league champion and coach of the year Penny Collins has Columbia State rolling. The programs success got a nice upgrade with the addition of talented and raw inside big Gonda Ameri (Smyrna). Will Smith (Lighthouse Christian) was the cornerstone of a very successful Lighthouse team that dominated in their particular classification. He will attend Cleveland State Community College in the fall and play for veteran skipper Lee Cigliano. Conference tournament champion Walter's State and long time head man Bill Carlyle reached into Knoxville and grabbed the very talented shooting guard Andre Wilson (Austin East). Staying in the junior college ranks several of the Memphis area players decided to venture out of state to continue their hoops careers including Tim Shaw (Germantown). The dynamic lead guard will cross the border and attend Pearl River Community College in Clinton Mississippi. The Wildcats are coached by veteran leader Richard Mathis who begins his 34th year at the helm. Taking the train out West, Chris Jefferson (Memphis Central) takes his talents to the prairie and will suit up for the Jets of Northern Oklahoma College-Enid. The Jets are coached by Greg Stanburg. Down in Texas, the Lone star state welcomes high scoring Freddie Williams (Douglas). Williams will suit up for the Seahawks of Lamar State College-Port Arthur who are coached by Lance Madison. Skirting away from the Junior College ranks down in Madisonville, Hiwasee College welcomes a trio of signees with Tristan Noe (Claiborne), Tyler Parker (Cumberland Gap) and Shawn Logan (Cumberland Gap). The Tigers will be coached by first year mentor Will Raby and compete in the NCCAA. Staying East, Milligan College welcomes one of the work-horses for the Class AAA state champion Blackman Blaze into the fold this fall. Edward Kalu (Blackman) brings spirit and athleticism to the Milligan campus and will be a welcome addition for head man Bill Robinson and the Buffaloes. In the Western portion of the state, Bethel University and head coach Jeff Britt welcomes a couple of talented newcomers in high scoring Justice Scott (Huntingdon) and dynamic lead guard Zay Coleman (Lake County). The Lions of Freed-Hardeman are fresh off an outstanding season which saw them finish 16-2 in the American Midwest Conference of NAIA and close with a 29-6 overall mark. Coach Jason Shelton was named the Don Meyer NAIA Coach of the Year for his continued outstanding efforts at this level. The Lions welcome a fearsome foursome into the tradition rich Henderson Tennessee program with Trevor Randolph (Goodpasture), Joseph Williams (Lausanne), Ben Brown (MTCS) and Andrew Golden (Columbia Academy). Finally lets take a short trip up to the basketball crazed state of Kentucky where one of the best programs on any level the Panthers of Kentucky Wesleyan welcome the talents of Charles Sutton (LaVergne). Wesleyan plays in the G-Mac conference of NCAA DII and is coached by legendary mentor Happy Osborne.